Thoughts on the Edge 510. Excellent satellite accuracy with GPS + GLONASS. Much improved data transfer rates. The touch screen is clumsy. Inferior virtual partner function compared to the 500. The LCD requires permanent back lighting for 500-level contrast. Caloric measurement is less accurate. Power calibration is slower to set up. Data fields in primary workout screen are hardcoded. On a recent training ride up Mt Donna Buang I experienced significant GPS drift with my Edge 500. The dense bush and the mountain itself were getting in the way of the satellite signals. This was frustrating for a couple of reasons. Firstly, it meant that my record of the ride displayed a GPS track that ran off course, and whilst I had set a ~ 57min time on the mountain I had no record of this on Strava (I subsequently corrected the climb time using SNAP at raceshape.com). But more importantly, it affected my training on the ride. I routinely use the virtual partner (VP) function on the Edge 500 to race against other people’s efforts. You can set this up by entering a Strava segment URL at raceshape.com and choosing any effort on the leaderboard as a course to export to your device (mouseover and click the arrow-in-circle). Once activated on your Garmin, two course pages become visible – a profile and aerial view – and once you start the segment you’ll see your position and your VP’s, along with time gap, distance gap, and distance to go. I’ve made notable progress in recent months, racing faster ‘virtual’ riders up a number of climbs, resulting in improved strength and threshold power. My climb up Lake Mountain was done like this, as was going sub-19min on Kinglake. On Mt Donna Buang, I was racing a guy with a mid 50min time, and leading him up the hill, when the signal began to drop out. I could have switched over to a power page and pushed myself at threshold. I would have got a faster time if I’d done so. But the VP motivates me and I thought it might kick back in at any moment, so I sat on it. In the end, it dropped in and out throughout the second half of the climb and my pace backed off. 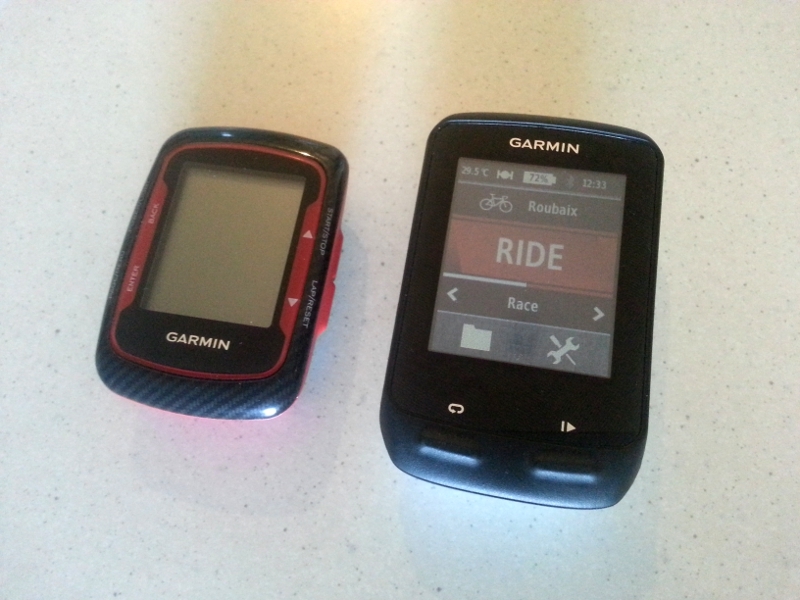 Enter my interest in the Garmin Edge 510, the successor to the Edge 500 which I use. Perhaps the most attractive feature of the 510, and one which promised an apparent solution to my experience on Donna, is the combination of both American GPS satellites with the Russian GLONASS system. Double the number of satellites and you double your GPS tracking precision, with much less chance of off-course drift. In my case this would prevent my VP use getting messed up. I began to look into getting a 510, but I was immediately concerned to read the course and VP handling on the device had been changed. I asked my friend Jeremy to test this for me, but he went one better and lent me his 510 for a week, using my 500 in exchange. What a legend! My first impression of the device was that it was big. Edge 500 left, Edge 510 right. Switching it on, my second impression was that the touch screen was difficult to operate. I hadn’t anticipated this. I figured I would get used to it, but my difficulties persited. Attempting to swipe pages often resulted in bringing up the menu instead. Tapping to remove the menu often didn’t work. And staring at the screen, tapping and swiping with increased vexation, whilst riding at 40-60kph, felt hazardous! Why is a touch screen necessary at all? I don’t think anyone ever complained about the absence of one on previous Garmin devices. To my mind this is a big engineering fail: form over function. So, to what concerned me most about the 510’s changes, the VP function. By default, the virtual partner page is activated on the Edge 510. It sits there as a general pacing function – you set the average speed of the VP and see your position relative to it through the ride. Well, I didn’t want to see any of this, unless I’d activated a course. I want to be able to move through the pages I use without seeing the ones I don’t. On the 500, the course pages appear once a Course/VP is activated. So I removed the VP screen on the 510 and figured it would pop back up when I activated a course. Downloading a course from raceshape.com was the same as for the 500, in fact the export was much faster. But once activated out on the road, the VP screen I’d removed did not reappear. So if you want to use the Course/VP function you must have it on at all times, adding an additional screen to swipe through when not in use. To be fair, you can swipe in both directions on the 510, so you could do this to avoid the course screen, but that is complicated and unintuitive, on an already cumbersome interface. On the 500, when you go to select your course in training /courses, the courses are always ordered by proximity, with the nearest one to your present location at the top. This makes it easy when, like me, you have a lot of courses on your device. On the 510, however, they’re ordered by name. Approaching the start of the 18min Kinglake climb I suddenly found myself having to unexpectedly scroll through a dozen shorter climbs. Again, hard work with the clumsy touch screen whilst riding through the undulating turns before the climb’s start. The ‘Dist. to End’ field no longer appears on the Course/VP screen. Distance to go is really helpful to know on longer climbs. You can add it on a separate screen on the 510, but then this means more cumbersome swiping. Edge 500 Course Screen (profile page). Virtual Partner represented by unfilled circle. All fields real content including actual elevation profile. By contrast, the Edge 510 Virtual Partner screen. Similar to the Edge 800. Two fields and pretty colour pictures (not an actual elevation profile). Furthermore, whilst riding along the segment, turn indicators are imposed over the VP information, on the approach to, and through any corner of a certain number of degrees (I don’t know how many degrees of turn are required to set this off but it happened on most bends). This is infuriating: Yes, I can see the road is turning, and now I can’t see where I am relative to the VP! You can tap the screen to remove it – more cumbersome touch-screening and distracting when you’re at max effort – or wait until you’re through the corner and it will return to the VP screen. 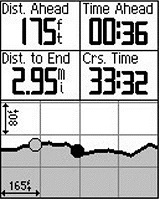 I realise now, that much of the page’s appearance is taken from the Garmin 800. I wonder how much of what I also feel is problematic with the 510 is also characteristic of the 800, which I have no experience with. It seems strange that the 500, as the supposedly lower-end device has a more complex Course/VP functionality. If the old idea was to have the 500 as a leaner racer’s computer, with better VP handling, and the 800 as more of a randonneur’s computer with more emphasis on navigation and appearance, it would seem the new idea is to take the whole range in the later direction. In a way, this makes me feel like the 510 is more purposefully a recreational cyclist’s device – a feeling which is reinforced by the increased weight of the device and the unnecessary bells and whistles, like the colour touch screen. So my two big grievances with the 510 are the touchscreen, which I find difficult and unnecessary, and the changed handling of courses which has thrown away some really useful features. But there are a few more issues which I feel detract from the device. I’ve already mentioned the colour screen is an unnecessary ‘bells and whistles’ addition. But what’s worse is that the text on the 510 has become harder to read as a whole, with reduced contrast as a result of larger fonts on a colour background and a dim LCD screen. This would seem to be the opposite to the intended effect. I’m not the only person to have this reponse: A thread on the Garmin forum suggests the solution is to run the back light permanently at 40%. To my mind, if this is really necessary, this is another engineering fail. 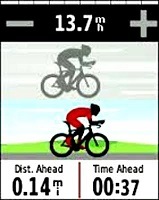 Garmin have also employed a new method of determining how many calories you burn on a ride. On the 500 you can chose your ‘Activity Class’ in the user set-up. The higher the Activity Class, the more serious an athlete you are and the lesser your caloric burn will be. If you were to treat Strava’s calories as a guide to your day’s energy allowance you would get fat very quickly. But using the Edge 500’s Activity Class, set to the upper end (and viewable in Garmin Connect or Garmin Training Center), can give you a pretty accurate estimation. I know this because I have logged every calorie I’ve consumed for the past fourteen months, using cronometer.com. For a while I used Strava’s calories and started gaining weight. When I switched to the Edge 500’s Activity Class measurement my weight fell and then stabilised, indicating a more reliable measure. But with the 510, Garmin have changed to the ‘Lifetime Athlete’ measurement used by their Tanita monitor. Instead of a scale of 10 classes, we now have two categories. Either you’re a lifetime athlete or you’re not, with corresponding caloric values. So I chose ‘Lifetime Athlete’ but the caloric measurements are now way closer to Strava’s inflated measurements. For example, after my Kinglake climb yesterday, the 510 claimed I had burned over 1400 calories. But my TSS was equivalent to rides which burned half that amount using the proven Activity Class scale! Again this reinforces the idea that Garmin are targeting a more recreational market with these devices. Lastly, when Garmin released their Vector power meters they updated the Edge 500 firmware to automatically offer a power calibration the moment your meter is detected. Two buttons: arrow on to ‘yes’, then ‘enter.’ Done. On the 510 I don’t get this offer. It tells me when it finds the meter, but pressing on that just makes the message go away. Instead, calibration requires digging around in the settings a bit more. It only takes a minute, but still, it’s quicker on the 500. EDIT: Since originally writing this little review I’ve found another problem. The data fields on the primary workout screen are hardcoded. Speed is a useless field for me when I’m on the trainer; I don’t use a speed sensor and I use the power meter for cadence. I went to swap it out for a power field and found I couldn’t. Sure, I can set this info up on another screen, but then there’s more frustrating touch screen operation that really shouldn’t be required. Garmin have apparently acknowledged the problem. How much beta testing was done on this device before it went to market!? So … how about the satellite tracking, GLONASS and all that? Well, that’s very good. But, on balance, the Edge 510 appears to me to be a more complicated and less functional device. I’m sticking with the Edge 500. PS. If anyone can correct me here, and improve my experience with the 510, please do. PPS. This review is specifically limited to the concerns I was looking to address in my short test of the device. I could write a long review addressing all the features of the 510, but in short, beyond the excellent satellite tracking, the bonus features don’t interest me. The phone integration seems like total bloat to me – the last thing I need is for something to make my phone’s battery life shorter. The 500 as it is + GLONASS would be the perfect device for me. Nice review. Just the fact that you can still buy a Edge 500 unit so long after the 510 came out says something. Jeremy, I’d be really interested to know if you’re finding yourself missing features of the 510 while you’re stuck with my 500, or if there are aspects of the 500 you like. I would like to get some clarity on the Virtual Partner on the 500 vs the Virtual Racer on the 510. I have read that the 500 only does average speed on courses in the Virtual Partner and that the Virtual Racer in the 510 does variable speed (like slowing down on uphills and speeding up on downhills). Now some blogs state that this is possible with the 500 as well through the Raceshape website (apparently this site has been closed down? ), setting up courses in TCX format, maybe you guys can clear this up for me please…..or something like that. It seems that most guys are bummed about the “Distance to go” which is not in the Virtual Racer on the 510, but found on the 500’s VP. I’m not certain that I want to pay R2000 more for the 510 just because it has bluetooth. Most guys say they will rather stick to their 500 anyways. Let me say that I have never owned a Garmin Edge, but I am close to pulling the trigger now in getting one….just not certain which one, I am leaning towards the 500 though. I mostly ride alone and it would be great to have some sort of a “partner” that rides variant speeds to push me a bit….maybe crush a Strava segment pb or 2. One last question…..do I have to start the virtual partner manually or does it start automatically once I ride into the course? I’m just thinking that if you start it manually and you start it a couple of seconds out, will your time be out with the virtual partner/racer? Thanks for your questions JJ! The effort you race as a virtual partner will behave just as the rider did, whose effort you download – slowing on climbs, speeding up on descents, etc. Once you load up a virtual partner it will remain inactive until you cross the starting point of your course, then it will spring to life automatically. I’d also recommend holding the 500 and 510 in your hands and seeing what the interfaces feel like. I found the swipe screen of the 510 very unintuitive. To my mind, the only advantage of the 510 is improved satellite tracking, but this should only be a concern for you if you ride a lot in forested areas.